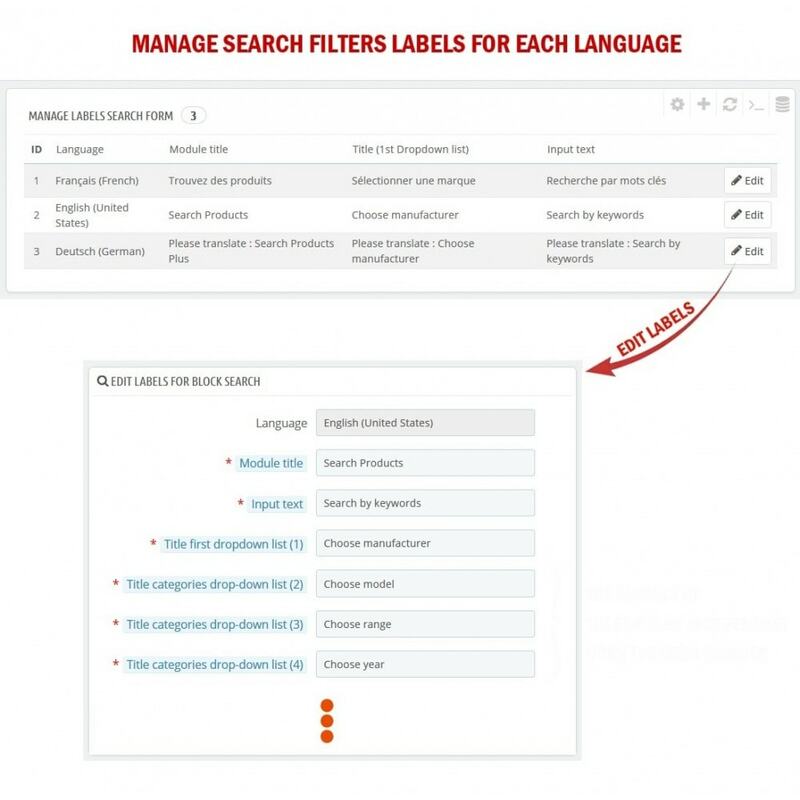 This module allows you to set the labels used in the search block to fit your marketing needs. Taking the example of a site that sells consumables for printers, you provide the brand, model of your printer from a proposed dropdown lists, and if you manage three levels of categories, you provide also the range, and so on. 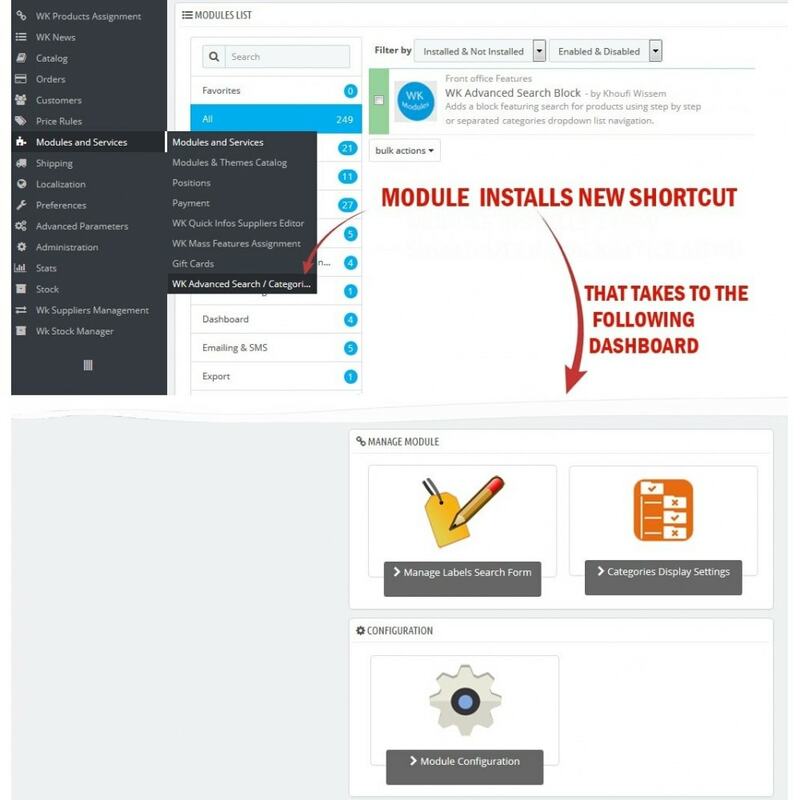 By following a Multi-level "Step by Step" navigation system using categories dropdown lists, the site shows you a list of consumables compatible with your printer. The same principle can also be applied to search for spare parts compatible with your vehicle. 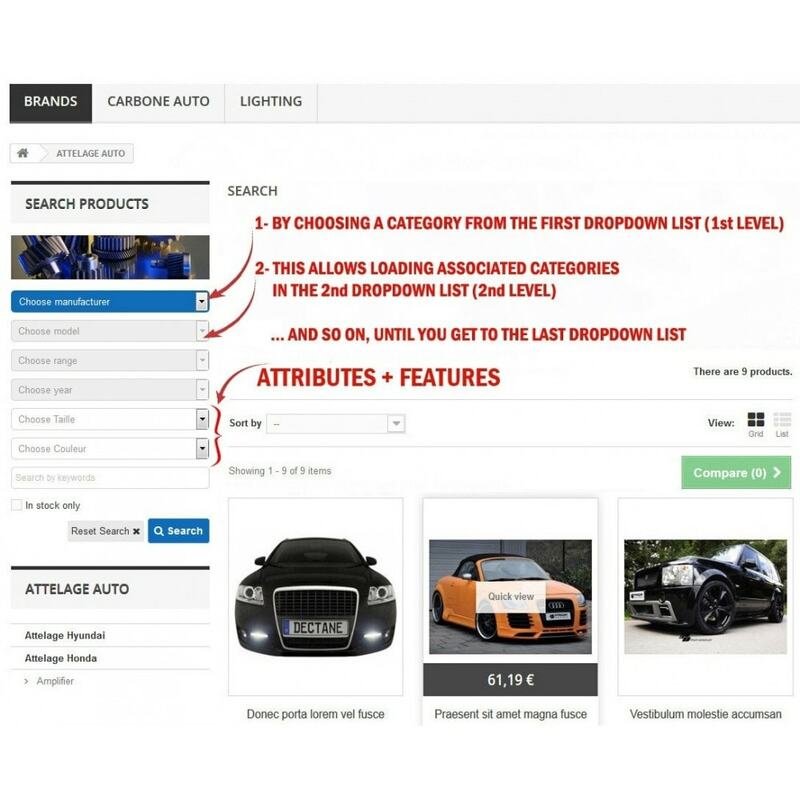 We make available an important feature which consists in displaying only products that were RELATED to the stored categories filters when navigating categories pages (e.g: display spare parts only for the selected vehicule; please refer to the Help/FAQ tab of config. page for more informations). 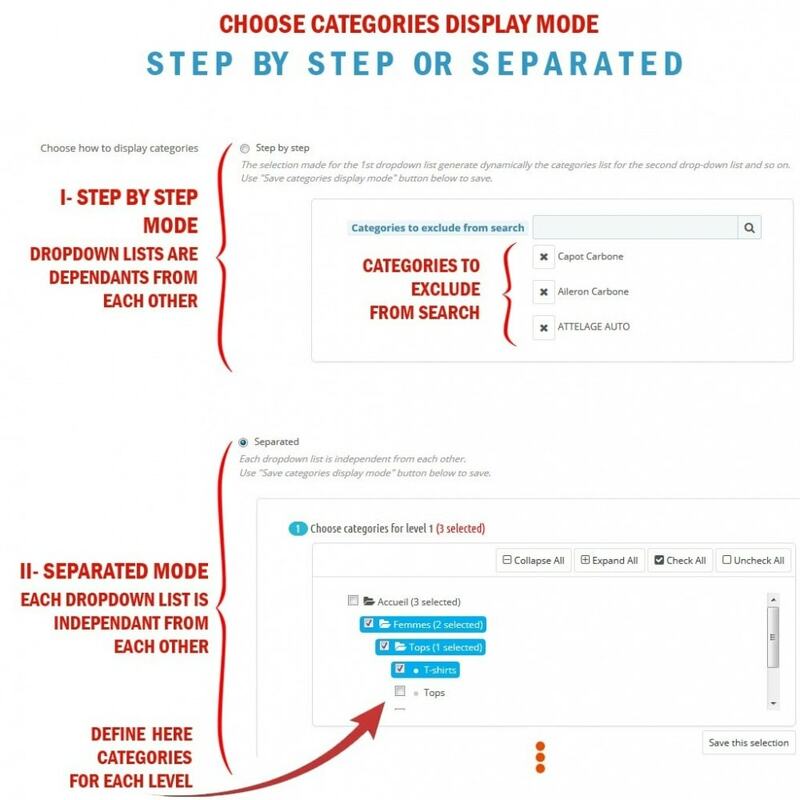 Option to search matching products where all selected categories exist at the same time in a product. Option to search through all sub-categories. => Dropdown lists will be independents from each other. 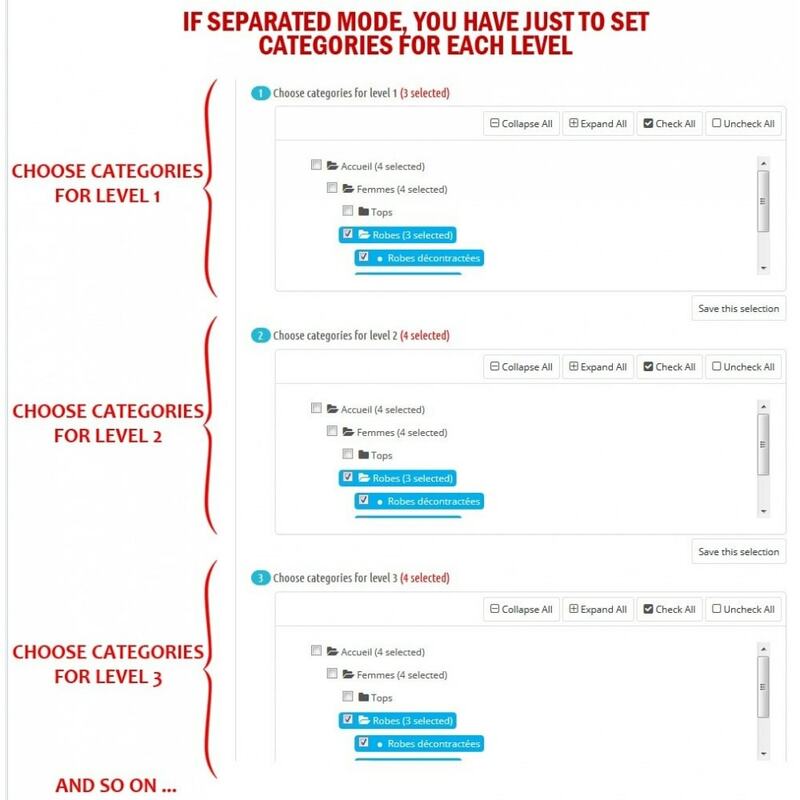 => Manually categories assignment for each level (control which categories to put). - Through the input area, enter a reference, consumable number, piece number, etc. - Have only products in stock. 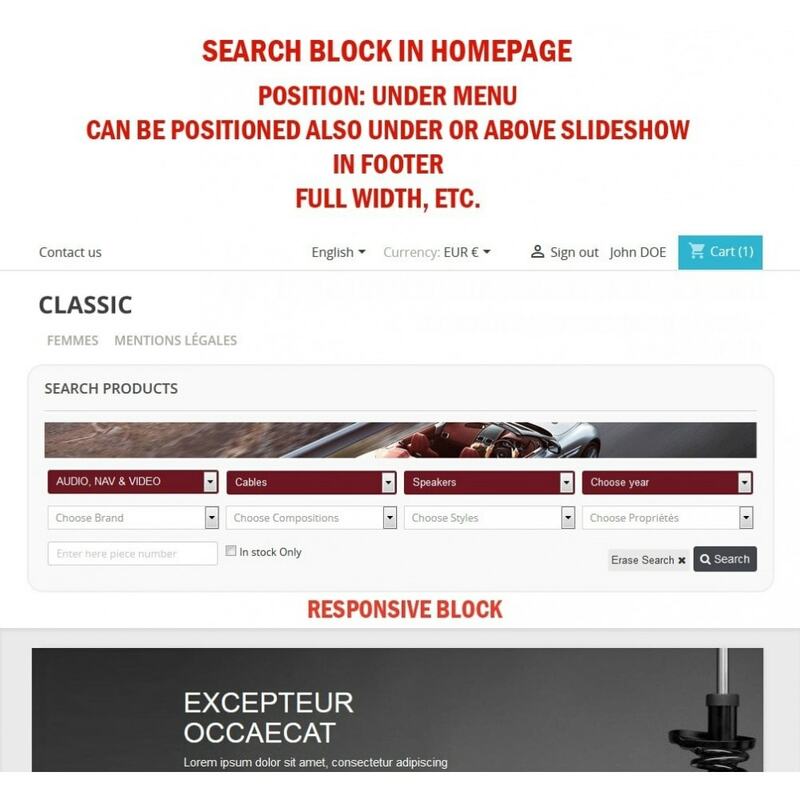 - Search by brands (manufacturers), features, attributes. You can reset and empty instantly the current search. 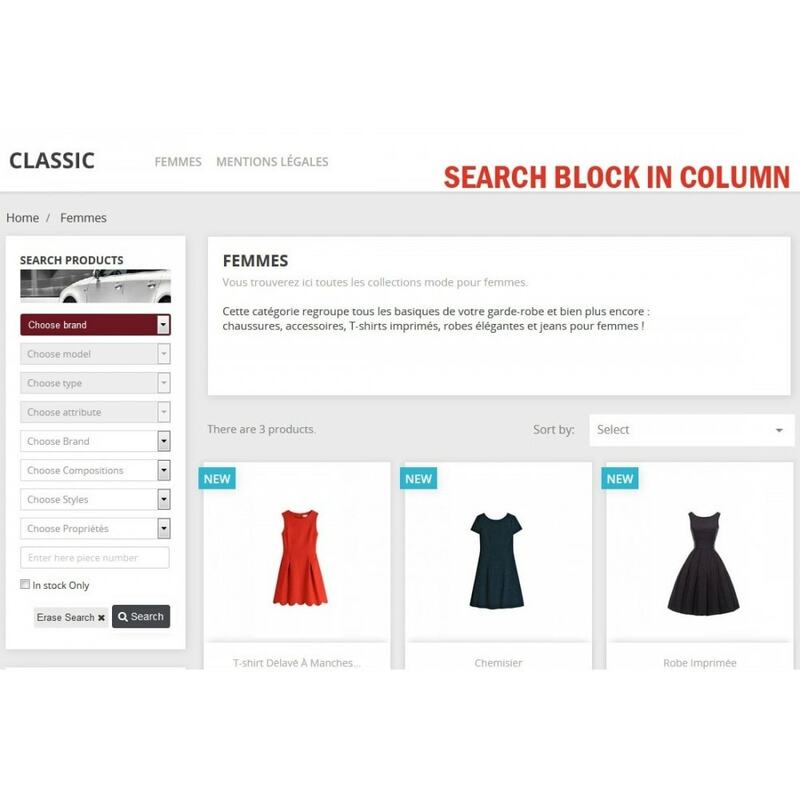 Load the search engine block in an elegant and responsive POPUP. Metas (title, description and keywords) of the used and selected filters. Improve SEO - Display a reminder of the selected filters just by having H1 tag available at the top of results pages to help your website to be ranked better by the most known search engines. Improve SEO - Friendly URL (Rewrite search result's URLs according to the selected categories). Responsive design (Works on all smartphones and mobiles). 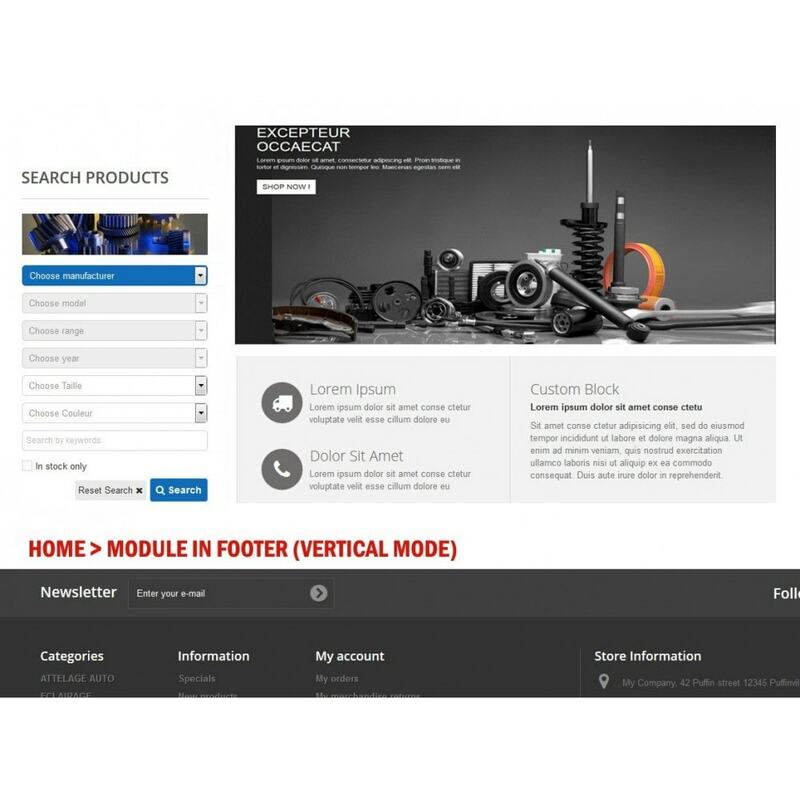 Search "Step by Step" and Quickly products using proposed categories dropdown lists. Performance: The module supports a large number of categories. It has been tested with more than 6100 categories without any problems and did not affect the speed of query execution. 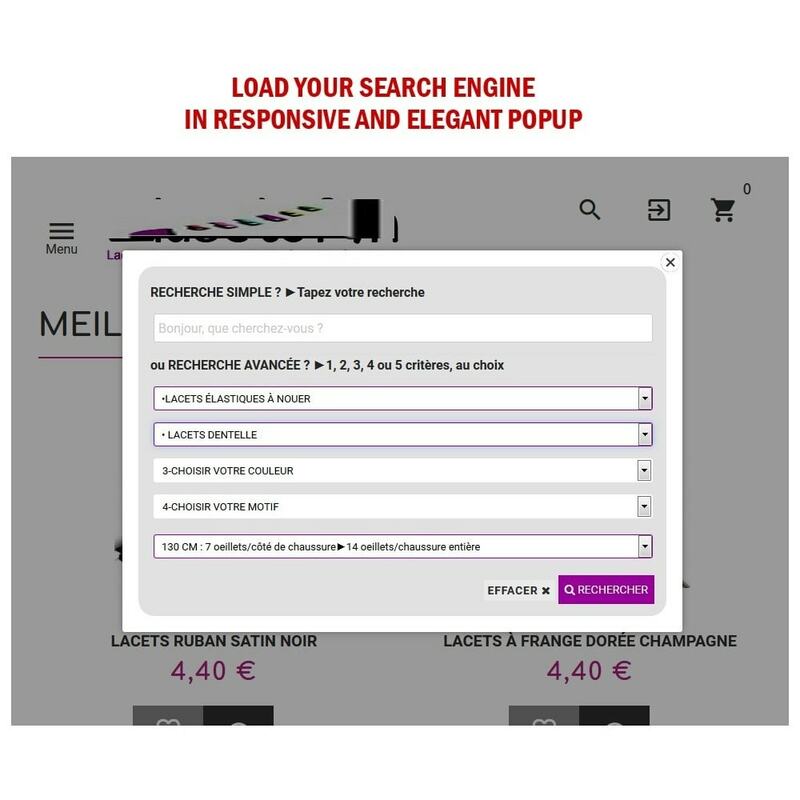 The module uses the native indexing power of Prestashop tables, so execution and loading speed is ensured. 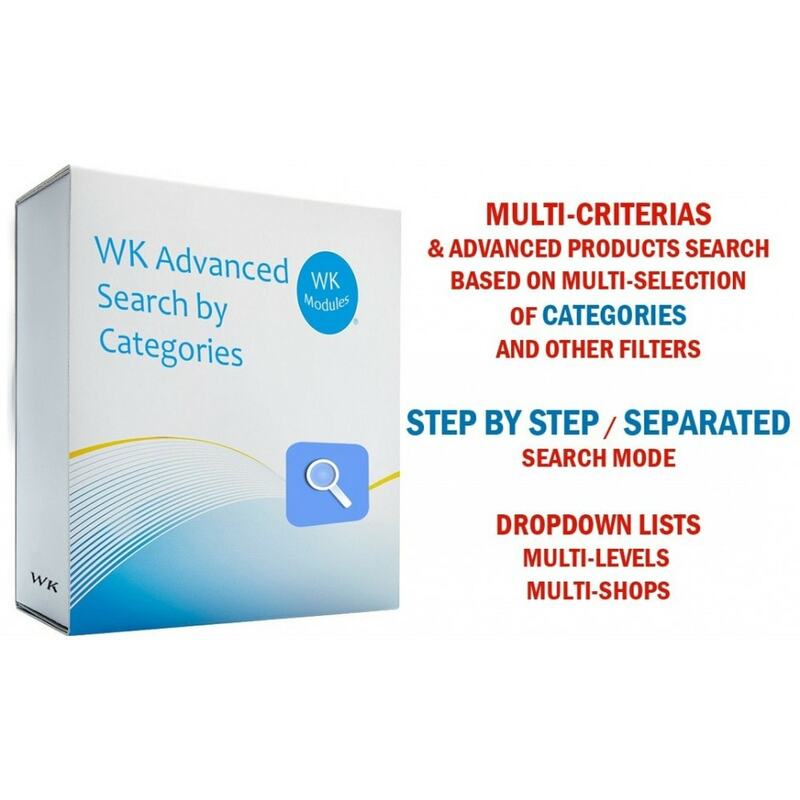 With this module, you can also create a STEP BY STEP search engine using Categories, Manufacturers then categories, Attributes or Features. Add ability to sort search results by reference, quantity, added date, modified date and manufacturer' name. Add ability to set close button color for popup. Add ability to set title color for popup. Improve SEO by giving ability to remove the category ID from url. Fix minor bug about loading related attributes/features (select default label duplicated).